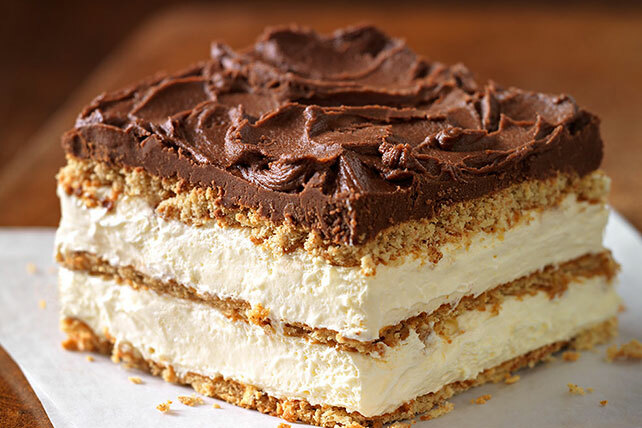 Delight the whole crowd with our delectably airy Graham Cracker Eclair Cake. Graham cracker layers become cake-like and soft alongside the pudding. Beat pudding mix and milk in large bowl with whisk 2 min. Let stand 5 min. Meanwhile, cover bottom of 8-inch square pan with graham squares, overlapping as needed to form even layer. Stir COOL WHIP into pudding; spread half over graham squares in pan. Cover with 10 of the remaining graham squares. Repeat layers of pudding mixture and graham squares. Refrigerate 3 hours. Spread with BAKER'S ONE BOWL Chocolate Frosting.